In a former nursing home parking lot, the Imaginarium is a participatory project that took place with the students, teachers, administration, and parents. 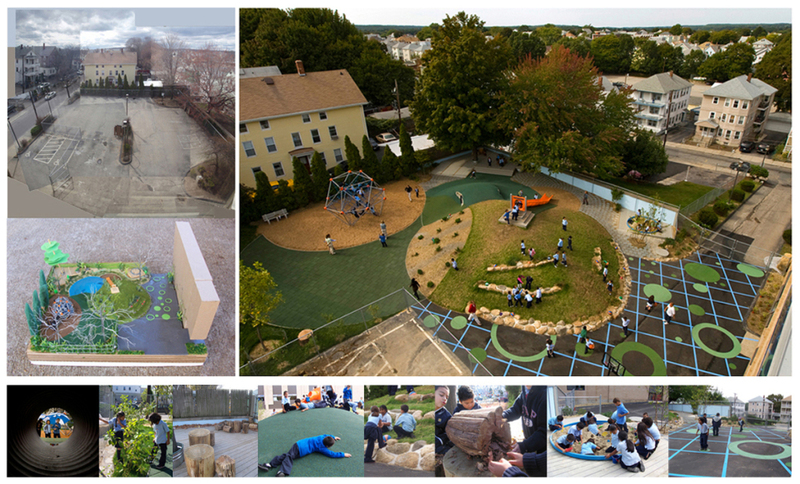 With Laurencia’s leadership, together they designed and built an outdoor play and learning space at the Learning Community Charter School, a public elementary school in Rhode Island’s most densely populated city. Fluid spaces use subtle differences of material or enclosure to create micro-habitats where fast and slow activities can co-exist with exposed and more protected activities. Spaces for running are along side outdoor gathering spaces for investigative learning. Some materials are fixed and others are flexible. The centralized mound feature provides sound absorption and elevation to give a sense of being elsewhere and on site at the same time. 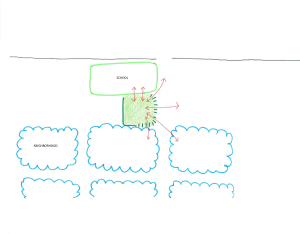 This play yard functions as a link between the enclosed school building and the surrounding community. Passersby see the innovative processes of the school and the school has more of a sense of place with the presence of native plants and local materials. The participation of the school community in the design and building process gave a sense of ownership to the many people involved who live in Central Falls, Pawtucket and Providence area. Laurencia also contributed to the successful $110,000 funding proposal.